As leaders in medical education, our vision is to improve the health and well-being of the people of Saskatchewan and the world. Supporting that vision is our work to ensure our undergraduate medical education program meets national standards for educational quality. The program is fully accredited through March 2018 and the college is working to ensure its continued accreditation following our fall 2017 Accreditation Visit schedule October 29 - November 1, 2017. Our medical doctor graduates benefit from an innovative and interdisciplinary education during which they develop into culturally competent, skilled clinicians. The undergraduate program prepares them for the next stage of their training, while contributing to the improved health and well-being of the people of Saskatchewan and the world. Following the accreditation process is a key component of improving the health and well-being of the people of Saskatchewan and the world. Regular self-evaluation of the medical school’s performance against national standards enables program administrators, faculty and staff to continuously improve the quality of the undergraduate medical education program at the College of Medicine. The qualities/characteristics required of all Canadian medical schools are contained in the CACMS publication CACMS Accreditation Standards and Elements (S&E) and have been organized into 12 overarching standards with 93 elements which the college has grouped into four key areas. In the DCI process, administrators, faculty and staff document how the college is meeting or exceeding the various requirements within the 12 CACMS standards as well as provide qualitative and /or quantitative data to support the information provided. 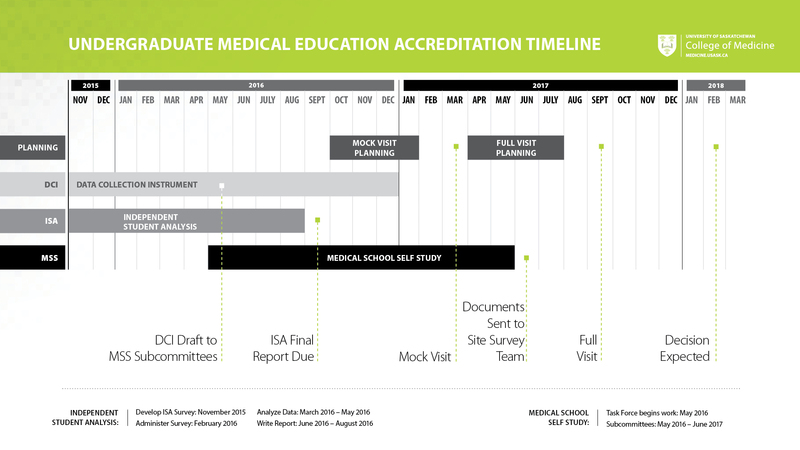 In the ISA process, medical students carry out their own review of the UGME program, student services, and other areas of relevance to students. Planning for the student survey and the interpretation of the results is a student responsibility as outlined in the CACMS publication: The Role of Students in the Accreditation of Medical Education Programs in Canada. In the MSS process, the medical school self-study task force and its subcommittees are responsible for conducting the self-study. Each subcommittee reviews and analyzes the ISA, the most recent graduation questionnaires, and the DCI data, narrative responses and appendices for the elements to which they have been assigned. The subcommittees carry out the first evaluation and rating of elements, provide evidence to support the rating, and develop plans with timelines to address areas of unsatisfactory performance. Subsequently, the task force analyzes the subcommittee reports, along with the supporting documentation and any new information, and revises as appropriate the individual subcommittee element ratings. The task force updates the evidence to support the rating and the final plans to address elements where performance is unsatisfactory and elements requiring monitoring. The task force creates the final self-study report that includes a summary of the elements that are strengths of the medical school and elements that require attention to ensure ongoing or future compliance with accreditation standards, and to improve the quality of the educational program and medical students’ experiences. Following the mock visit, we developed a focused plan for managing the remaining portion of the accreditation process. We chose to use and apply strategy deployment as well as project management best practices for planning and executing the full visit. Our goal is to achieve a full eight-year undergraduate accreditation – the maximum length of time between accreditation visits. We split the work into two projects focused on delivering a quality (medical education) program and a quality (accreditation) visit. We developed a weekly “wall walk” for the accreditation quality team to document, report status of these two projects, and enable improvements using the scientific method Plan-Do-Check-Adjust (PDCA). Applying strategy deployment methodology focused and aligned our work in planning for accreditation, enabling quick response to issues and opportunities and improving the system as needed. Our focus on transparent communication of vision, challenges, successes and progress increased team accountability, as well as senior leader, faculty, staff, and student engagement. With the engagement of administrators, faculty, staff and students across our college, we were able to finalize our documentation and submit it to the CACMS accreditation visiting team on schedule. The medical school self-study report, the ISA, the most recent graduation questionnaires and the completed DCI with its appendices were submitted to the survey team July 21. Now that our documents are submitted, the focus has shifted to participant preparation and executing the logistics plan for delivering a quality visit. The full visit is scheduled for October 29 – November 1, 2017. We have designed our plan to support visit participation preparation based on what we learned from the mock visit in February 2017. As part of the plan, we are asking participants who have been invited to attend one or more meetings during the week of October 29 – November 1, 2017, to prepare in advance. The intent of this approach is to support our participants, provide them with a positive experience and enable a quality visit. This preparation will include reviewing ‘what you need to know’ on the accreditation website and accreditation documentation, participating in at least one preparation meeting, and rehearsal meeting(s). Access to the documentation and other information will be provided to participants. The college has completed substantial work to restructure leadership and administration in order to successfully fulfill its mission. An expanded senior leadership team structure with three vice-deans covering education, research and faculty, and a chief operating officer leading administrative staff effectively supports the authority of the dean throughout the college. An enhanced leadership structure in the undergraduate program is enabling better support for students and for providing a high quality undergraduate medical education. On March 29, 2017 faculty council approved the college’s new strategic plan.The strategic planning process included a framework that incorporated broad awareness, assessment, and consultation with our college community and various other stakeholders, to produce a renewed vision, mission, values, principles and strategic priorities for the next five years. More information on the process can be found on the strategic plan website. The college has a strategic plan for social accountability. This is operationalized through admissions via the Indigenous Admissions Program and the new Diversity and Social Accountability Admissions Program (DSAAP). In addition to being woven throughout our curriculum, it is also integrated into medical education through service learning opportunities such as Making the Links, a two-year Global Health Certificate program for first-year medical students. As a deliberate plan to increase engagement of medical faculty, and in keeping with The Way Forward, a faculty transition is in process that separates university faculty appointment from the mode/type of reimbursement for academic work. The college's commitment to a One Faculty model has improved the recruitment process and facilitated improved engagement. There are now clearer expectations and streamlined processes for both academic assignments and remuneration. For example, the UGME Office has confirmed that recruitment of medical faculty for pre-clerkship and clerkship teaching and supervision in 2016-2017 was substantially easier than in previous years, with frequent instances of competition for teaching opportunities. With this change, One Faculty includes all faculty cohorts within medical, health sciences and the School of Physical Therapy. Medical faculty refers to all out-of-scope physicians and clinical PhDs with both faculty appointments in the college and clinical appointments in their respective health regions. The College of Medicine's primary funders are the Government of Saskatchewan's Ministry of Advanced Education and Ministry of Health. The total revenues for the college in the three years following the full accreditation site visit may be challenged by Saskatchewan’s current economic situation. In light of this risk, the college is diligently managing its funds and seeking opportunities for diversify revenue sources. The college, in response to student concerns, has secured new study space for students to augment those already available. Despite renovations to the health sciences building, all students are assured access to a secure storage space at the medical school. Secure storage space at the clinical sites was identified and communicated to the students. As MUMPS is unavailable during renovations of the health science building, lounge space for pre-clerks has been identified at St. Andrews College. The college has adequate numbers of call rooms for clerks, and the UGME and PGME offices are collaborating to ensure that assignment of call rooms is appropriate based on need. The College of Medicine does not tolerate student mistreatment of any kind. The college is committed to factors that promote a positive learning experience while working to address issues that negatively impact the learning environment. A new procedure has been approved for reporting student mistreatment as well as how to handle professionalism issues. The college has undertaken measures to ensure student safety by establishing policies and procedures such as the Medical Student Exposure to Infectious and Environmental Hazards Policy, which contains a procedure outlining how to handle blood or body fluid exposure. As well, students are made aware of university supportive services, such as Safe Walk and the USAFE app. The college’s new policies and procedures have been communicated to students, faculty and staff. The Aboriginal Admissions Program started in 1992 as the Aboriginal equity program, and at that time three seats were reserved in the MD program for applicants of Aboriginal ancestry. Since 2006, 10 per cent of the positions available in the MD degree program each year have been reserved for applicants of Aboriginal ancestry. Currently, this means 10 seats are available, of a total of 100, for Aboriginal applicants. Since 2012, the college has received about 15 to 30 applications per year. Students who have applied through the Aboriginal Admissions Program are assessed first to see if they would be successful in the general applicant pool. If so, they are admitted in that category. If not, they are considered within the Aboriginal Admissions Program pool. In the last two graduate years we have set records for the number of aboriginal graduates at 10 or more each year. The college received university approval to implement a Diversity and Social Accountability Admissions Program (DSAAP), which will reserve six of the 100 seats in the MD program for individuals from socioeconomically challenged backgrounds beginning in 2018-19. Similar to the Aboriginal Admissions Program, students who have applied through the DSAAP are assessed first to see if they would be successful in the general applicant pool. If so, they are admitted in that category. If not, they are considered within the DSAAP. The curriculum committee has final authority over the curriculum, barring major revisions such as a change to the pre-clinical/clinical curriculum (two years pre-clinical / two years clinical), or an increase in the medical school size. The program objectives are used to set course level objectives, course content and method of assessment. Student feedback on courses and preceptors are used to enhance the curriculum and the teaching performance of our faculty. added interprofessional education modules to third-year student learning to support effective collaborative and team-based health care provision. Students are appropriately supervised by faculty during clinical sessions for their safety as well as patient safety. Our preceptors are made aware of the objectives and methods of assessment prior to teaching. Narrative assessment is used whenever student-preceptor interaction makes this possible, and students are given timely formative feedback on their progress. In spring 2015, the college hired a consultant to assess our students’ experience, given recent accreditation challenges and curriculum changes. Results of the study have informed the college’s efforts to improve customer service for students, response times to student concerns, transparency of information and improvements made based on student feedback. Examples of methods for increased communication with students includes the monthly Medical Student Update, titled You said…We listened, feedback forums with year chairs, dean’s lunches and monthly administrative meetings. Feedback from students and collaboration with the office of student affairs and UGME has led to enhancements to the career advising curriculum, academic advising, personal counselling, financial aid and debt management. The college has new policies to enable students to have increased flexibility for time away to access health services. As well, the wellness curriculum was revised through the active involvement of students. Mock accreditation – how did it go? A week of progress… and back to accreditation! From October 29 to November 2, 2017, the College of Medicine will have a full accreditation visit for its Undergraduate Medical Education (UGME) program. The Committee on Accreditation of Canadian Medical Schools (CACMS), in conjunction with the Liaison Committee on Medical Education (LCME) in the United States, ensures Canadian medical faculties' MD programs meet quality standards. Each school undergoes a full on-site assessment visit every eight years. On October 16, 2015, the UGME program was returned to full accreditation until March 2018 after having been placed on accreditation with probation status in 2013. Work in preparation for the 2017 visit has begun on multiple fronts, overseen by an Accreditation Steering Committee. Work on a Data Collection Instrument started in the fall of 2015, and is ongoing. Medical students completed a student survey—with a 90 per cent participation rate—as part of an Independent Student Analysis (ISA). More information on the results of the ISA and student survey will be provided next week. Many of our faculty, staff, residents and medical students are participating on six accreditation subcommittees, which began meeting in mid-May. They are reviewing and rating a full range of UGME program information as part of the Medical School Self-study (MSS) process. More information on the composition and work of the subcommittees will be provided in the coming weeks. A mock accreditation visit is set for February 5-8, 2017, and provides a ‘dry’ run of the formal accreditation visit for the college, further ensuring the accreditation standards will be met and the formal visit will be well coordinated. Finally, be sure to watch for details of an accreditation launch party being planned for September. Effective October 16, 2015, the Undergraduate Medical Education Program at the University of Saskatchewan’s College of Medicine is returned to full accreditation for an extended period, to March 2018. Accreditors will return for the next full accreditation visit in fall 2017, several months later than originally anticipated. Since 2011, the college has committed to investing much hard work and energy to address long-standing accreditation issues. The outcome of returning to full accreditation, for an extended period of time, is an indication from our accreditors that changes underway in the college are delivering the intended results. As we turn our focus towards preparing for the fall 2017 visit, we are mindful the accreditation process is about continuous quality improvement. We remain steadfast in our pledge to provide quality medical education to students in communities across Saskatchewan. A strong provincial College of Medicine benefits the people of Saskatchewan by serving as a cornerstone to our provincial healthcare system. This document is a summary version of the official letters of transmittal received from CACMS/LCME in October 2013 and March 2014. I am writing to share a very brief update on this week’s UGME accreditation visit. As you know, a site survey team from our accrediting body, CACMS/LCME, was in Saskatchewan from Sunday until earlier today. The team was assessing the College of Medicine’s progress on 13 standards of accreditation that were previously identified as non-compliant or in need of monitoring. From my perspective, this survey went very smoothly (despite the unplanned fire alarm on Monday) and the survey team commented on the many courtesies and accommodations extended during their stay. Personally, I was particularly impressed with the turnout and engagement demonstrated by our faculty, students and partners in both Saskatoon and Regina. The high level of participation is inspiring. As I’ve said before, we will not be informed of the outcome until later this fall, and I will not speculate on the findings. I will however commit to sharing with the entire college community the official letter of transmittal once it has been received, likely in late October. I want to extend my sincere appreciate to Dr. Sheila Harding, Dr. Athena McConnell, Kevin Siebert, Darla Wyatt and the entire UGME leadership group for making this visit happen – your teamwork has been truly impressive. As with any survey, there were several on-site requests for additional documentation, and our team rose to the occasion, responding with ease. Thank-you for making us all look good! Congratulations to our students who have finished writing exams – I will see you for your Convocation Ceremony and Graduation on June 4th. Best of luck to the first and second year classes as you continue with exams. And to our JURSIs, I hope I will see many of you on your Family Medicine rotations over at West Winds. I also understand the Admissions Committee is ready to send out Letters of Offer beginning on Friday, so we’ll have 100 new UGME students to welcome. Thank-you again to everyone who helped in making this visit a great success. More importantly, thank-you all for your daily efforts on behalf of the College of Medicine and our students. Beginning this Sunday, the College of Medicine will host a much-anticipated UGME accreditation visit. As you know, our undergraduate medical education (UGME) program has been on probation since November 2013, after previous accreditation visits noted deficiencies with 13 of the 139 accreditation standards for Canadian medical schools. As a college, we have been preparing for months, and I am confident we are ready to demonstrate significant progress since our last visit in March 2013. The four member Survey Team from the Committee on Accreditation of Canadian Medical School (CACMS) and the Liaison Committee on Medical Education (LCME) will be in Saskatchewan from May 10-13, and will make stops in both Saskatoon and Regina. The purpose of this limited site survey is to review eight standards that were previously determined to be non-compliant, and five standards that were described as compliant with a need for monitoring. These 13 standards are explained further in the Accreditation Decision Summary, and complete accreditation information is available online. You can also watch for an article on our preparations that will be published in On Campus News this Friday. We won’t know the results of this visit until fall 2015. I don’t want to speculate on the outcome, but I will remind everyone that accreditation is an eight-year cycle. When a program is on probation, it’s common for accreditors to complete two survey visits before changing a program's status. Our next full accreditation visit will happen in 2017, so given the timing, it would be unusual to have a second limited survey take place before the full survey in 2017. Regardless of the outcome, I do want to publicly appreciate the work of our department heads, the entire UGME office, Kevin Siebert, Darla Wyatt, and of course Drs. Harding and McConnell. I know they’ve been living accreditation for the last number of weeks, and their efforts have not gone unnoticed. On a related note – congratulations to our friends and colleagues in the School of Physical Therapy on your successful Master of Physical Therapy program accreditation! Truly outstanding news that reinforces why I refer to the School as a ‘gem’ within the college. As always, my door is open, and I welcome the chance to hear from you directly. Read the April 2015 Accreditation Summary. I'm writing today to share details about the college's upcoming UGME accreditation visit. The four member Survey Team from the Committee on Accreditation of Canadian Medical School (CACMS) and the Liaison Committee on Medical Education (LCME) will be in Saskatchewan from May 10-13, and will visit both Saskatoon and Regina. The purpose of this limited site survey is to assess the progress we've made since the last visit in March 2013, which resulted in the program being placed on probation in November 2013. Specifically, the Survey Team will review eight standards that were previously determined to be non-compliant, and five standards that were described as compliant with a need for monitoring. These 13 standards are explained in further detail at (link - updated accreditation summary document). In preparation for the May visit, we have now submitted to CACMS/LCME our completed Briefing Book, which contains the required background material and information on each standard under review. It is available for reading at (link to PDF of BB). I am confident that since March 2013, the College of Medicine has made significant progress on many fronts. Stable, permanent leadership is now in place. More importantly, the college has brought together a team of people, including the vice dean, associate and assistant deans, and key administrators, to fully support the planning and delivery of our undergraduate medical education program, and our students. To help ensure the visit runs smoothly in May, a mock run-through of the various meetings will be conducted Monday April 20, Tuesday April 21 and Wednesday April 23. Details on both the mock and actual visit will be provided to all involved parties as the survey schedule is finalized. Thank-you for holding these times in your calendar and being flexible as the dates and times have shifted. We will not be informed of the results of our May visit until fall 2015. I do not want to speculate on the outcome, but I do want to reiterate that accreditation is an eight-year cycle. When a program is on probation, it is common for accreditors to complete two survey visits before changing the program's status. Our next full accreditation visit is due in 2017, so given the timing, it would be unusual to have a second limited survey take place before the full survey in 2017. You can expect another update from me early in May, following my return from Western University. As I have said before, accreditation is a form of self-regulation, and so I'm heading to Ontario next week to lead the full survey team for Western's accreditation. In the meantime, I want to acknowledge the efforts of the department heads and the entire UGME office in preparing for this visit. Thank-you for all of your hard work. We owe special gratitude to Dr. Athena McConnell and Dr. Sheila Harding for their leadership and expertise in this regard, and also to Kevin Siebert for his diligence and ability to pull it all together. I know how much time and energy this assignment demanded of departments and people, and I deeply appreciate your efforts. We have received verbal approval from CACMS/LCME on our action plan, as presented on April 15, 2014. We continue to prepare for our limited survey visit, and our task at hand is to carry out the tasks described in the action plans, with the goal of demonstrating compliance. As requested, a second Action Plan to address four specific standards was submitted to CACMS and LCME today. It will be considered for approval by the respective accreditation committees at their upcoming meetings. We have received verbal approval from CACMS/LCME on our Action Plan, as presented on December 20, 2013. The accreditors have now requested a second Action Plan to address four specific standards. It is due by April 15, 2014. Our University of Saskatchewan College of Medicine Action Plan was submitted to CACMS and LCME on December 20, 2013. It will be considered for approval by the respective accreditation committees at their meetings as follows: CACMS January 23-24, 2014 and LCME February 25-27, 2014. Further to the information disseminated on October 4, I am writing to share with you the formal letter of transmittal from CACMS/LCME. I want to reiterate that the College of Medicine remains fully accredited as we work to address the specific standards outlined in the letter. We do not intend to request a consideration of this decision. We will instead focus our attention and resources on addressing the identified issues. As we work through this process, you can expect regular progress reports. You may submit feedback and suggestions via email. There will be a Secretariat visit from CACMS/LCME in early December 2013, to provide consultative assistance in the development of the Action Plan. The Action Plan must be submitted to CACMS/LCME by the end of December. A note with respect to the last paragraph in this transmittal letter: In the Spring of 2013, a third party complaint submitted to CACMS/LCME about facilities and information resources in Saskatoon raised questions about standards MS-37 (study and lounge space, and personal storage space) and ER-7 (clinical instructional facilities and information resources). In light of recent upgrades to the St. Paul’s Hospital Library and the opening of E Wing in the Health Sciences Building, CACMS/LCME requested that additional information be obtained by surveying relevant student groups in Saskatoon, for submission by December 1, 2013. Brief surveys will be conducted for this purpose in the weeks ahead. Of the 10 standards under scrutiny during the March 2013 visit, six are now considered either “in compliance” (ED-8, ED-41, ER-4 and MS-37) or “in compliance with need for monitoring” (ED-30, ED-31, ED-44 and MS-32) – the latter designation may be used when compliance with a standard is new and relatively untested, or is at risk because of other events. ED-9 was added to the monitoring list – it pertains to the implementation of a new curriculum. Of the original 10 standards, four (IS-9, ED-2, ED-3 and ED-24) are still considered noncompliant, and a further two areas of noncompliance have been identified (IS-11 and ED-25A). The attached document provides the details of these six standards, along with the findings of the survey team from March 2013. This outcome was fully predictable: IS-9 was first cited in 2009, and has remained problematic through limited visits in 2011 and 2013, despite the warning that followed the 2011 visit. We will be required to develop an Action Plan (again, the details will be in the forthcoming transmittal letter) for submission to LCME/CACMS by the end of December 2013, for approval at their January 2014 meetings. Development of the Action Plan includes a Secretariat Consultation, wherein a Secretariat representative from each of the two accreditation bodies will come in early December to review the plan in person with those most responsible for its implementation. Arrangements are being made for two or three cross-site Town Hall meetings in early November to provide additional information to the CoM community, answer questions, and gather input for the Action Plan. We will also create a web page to enable ready access to the transmittal letter and to gather suggestions for inclusion in the Action Plan. It will be my responsibility to collate and edit the Action Plan document, with input from others as appropriate to the standards in question and the instructions in the transmittal letter. I hope to make use of the Accreditation Working Group of the Dean’s Advisory Committee to be my sounding board as I develop the Action Plan. Finally, it is important to note that the March 2013 survey team did not find fault with the overall adequacy of the current educational program. Preliminary information from the MCCQE1 exam in the Spring of 2013 suggests that the performance of our students is on the rise, contrary messaging notwithstanding. I urge all faculty, residents, and staff to be cognizant of the substantial impact of this situation on our students, and to continue to provide them with a sound educational program, accompanied by lots of support and encouragement. Thank you. I am writing to inform you that earlier today (Friday October 4, 2013), I received a phone call from Dr. Genevieve Moineau, President and CEO of the Committee on the Accreditation of Canadian Medical Schools (CACMS). This call was a courtesy to our school to inform me that our accreditation status has been discussed at the most recent meetings of CACMS/LCME. As you know, the College of Medicine is fully accredited, but has been on Warning of Probation since July 2011. Although the call today from Dr. Moineau is not official, she informed me that our Undergraduate Medical Education program will be placed on Accreditation with Probation. I want to reiterate, that despite this news today, our college will continue to remain fully accredited. An official letter of transmittal detailing this decision is expected later this month. I will communicate further once I have received further information.